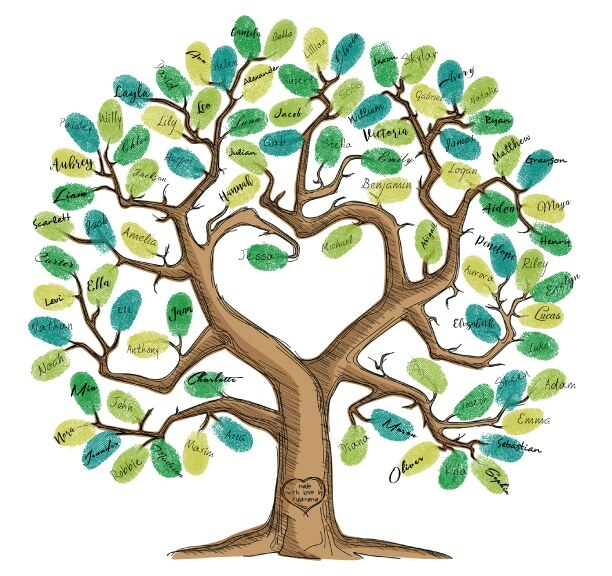 A traditional baby shower guest book is a wonderful memento that holds messages and wishes for your special day. 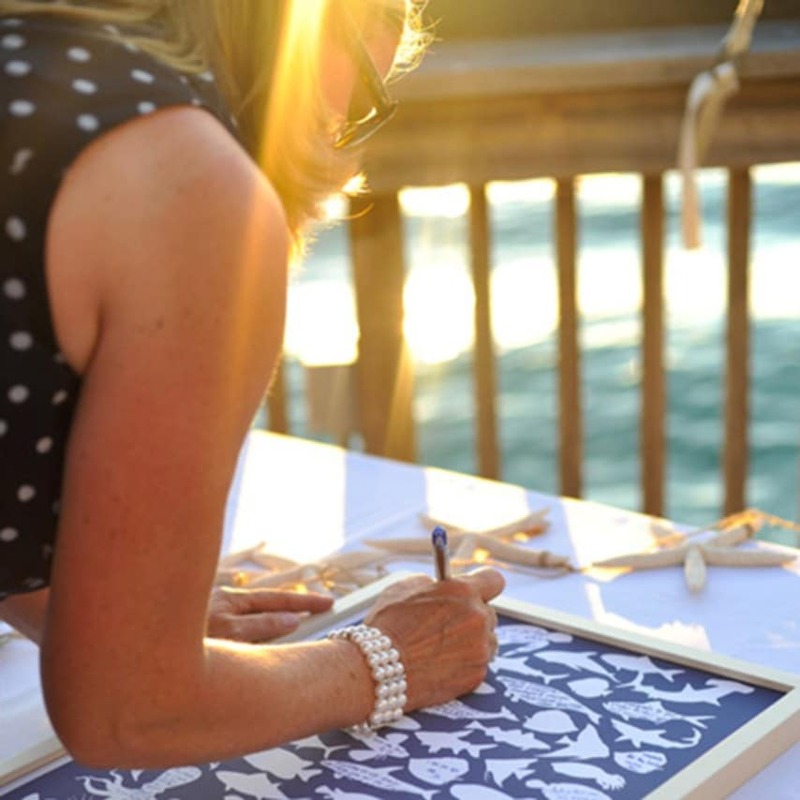 It’s a beautiful tradition, for sure, and there is little fear that traditional guest books will go out of style. 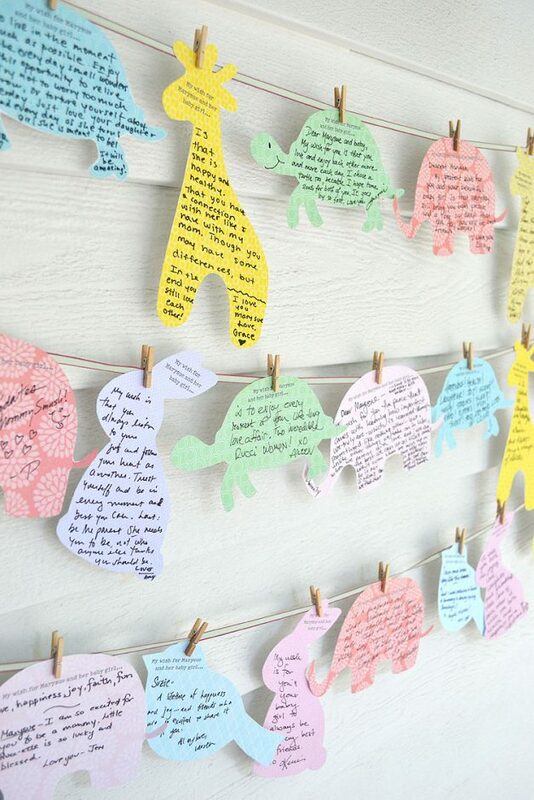 However, thanks to tons of baby shower guest book alternatives, they have strong competition. 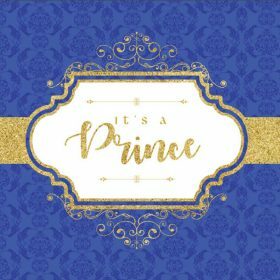 Below are several creative and unique baby shower guest book alternatives. Some are easy and fun to implement, some are a little harder. 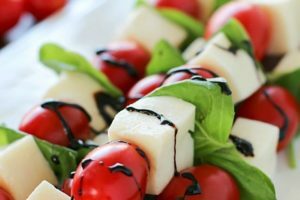 What you choose will depend on your personality, your budget and the theme of your baby shower. 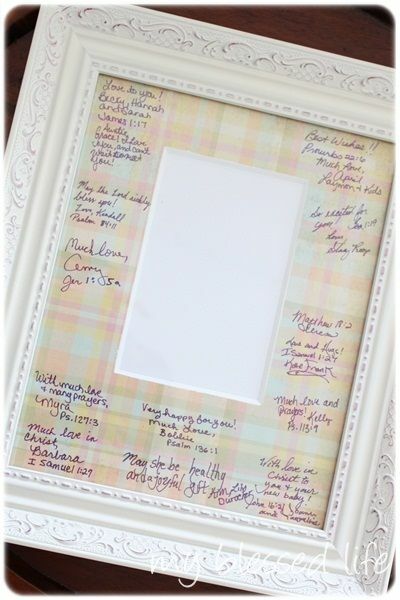 If you are having a rustic baby shower, this is a great guest book alternative. Your guests can sign their names and leave messages or wishes for the baby on this big initial. This is perfect if you have already decided on baby’s name. 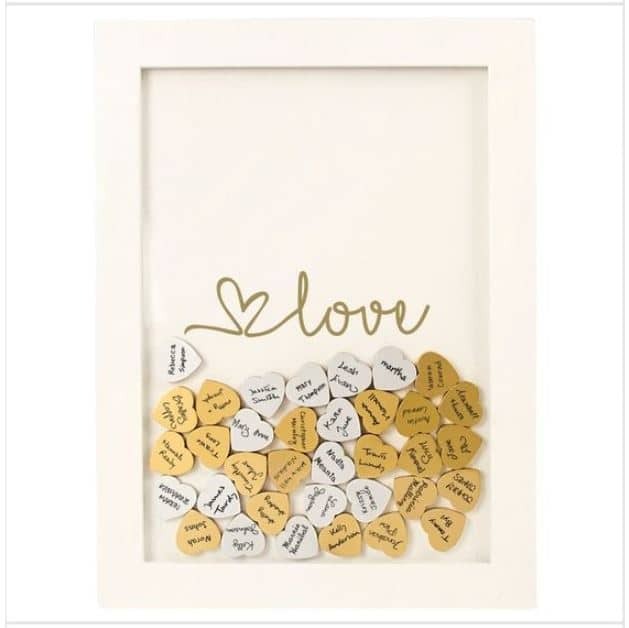 Guests can write their names on the little hearts, then drop it into the picture frame. You can then hang up your frame somewhere you can see it all the time. These drop-in heart picture frames are available from Etsy for relatively cheap, or you can make one yourself. Here is a great tutorial. 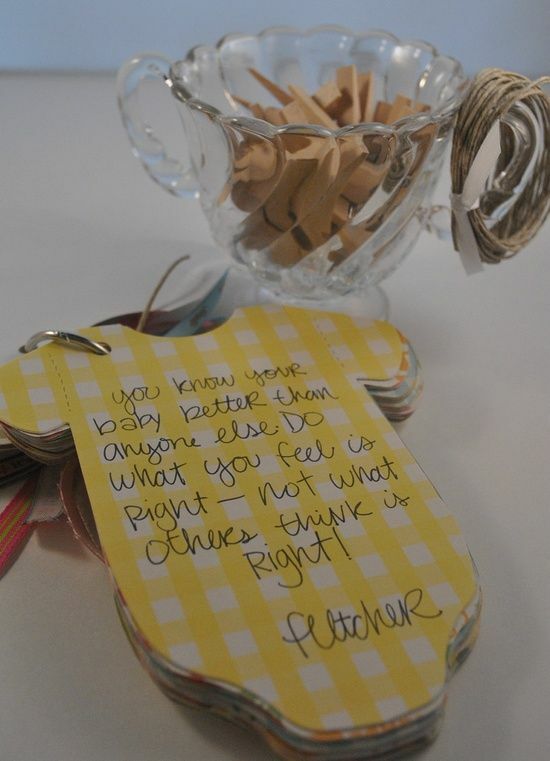 is designed to be neutral, so you could use this at a baby shower or a wedding. And if you know someone who is artistic, you could have the baby’s name. or the couple’s names written inside the heart. 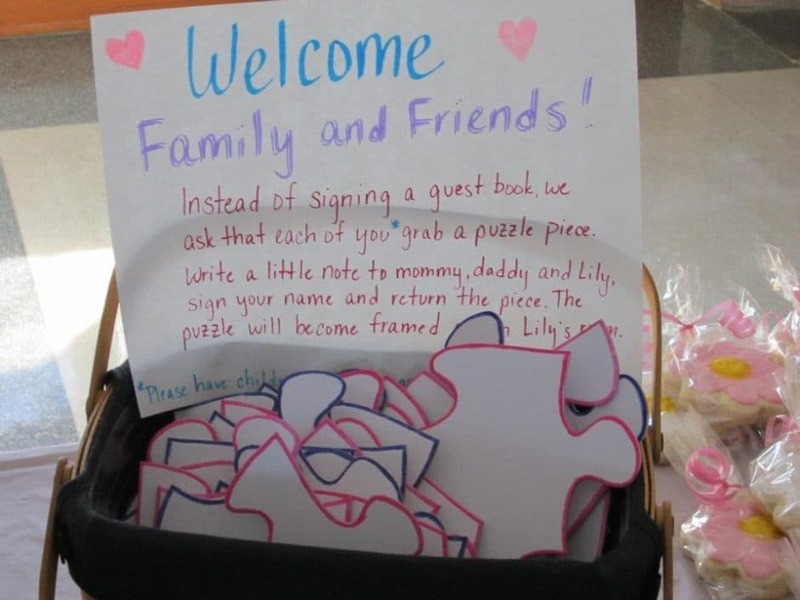 Not only is this one of many great guest book alternatives, but it’s also a great baby shower activity. New moms also love this because they can reference it later for good advice. 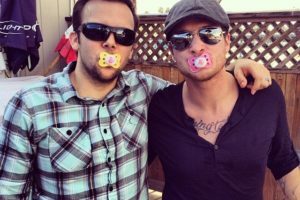 How adorable, and how appropriate for a baby shower! 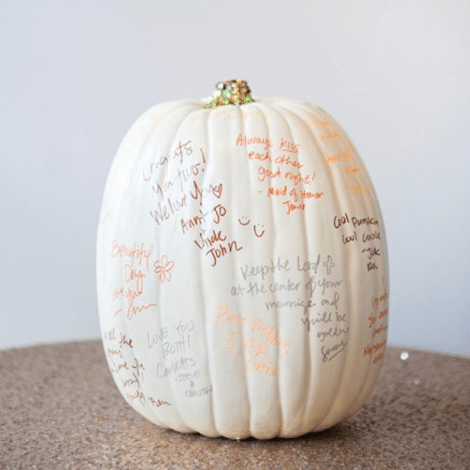 To make this guest book alternative, you will need a onesie and a permanent marker. Your onesie can further be decorated with a little necklace and flowers like the image. Once everyone has signed in, you can frame your onesie. 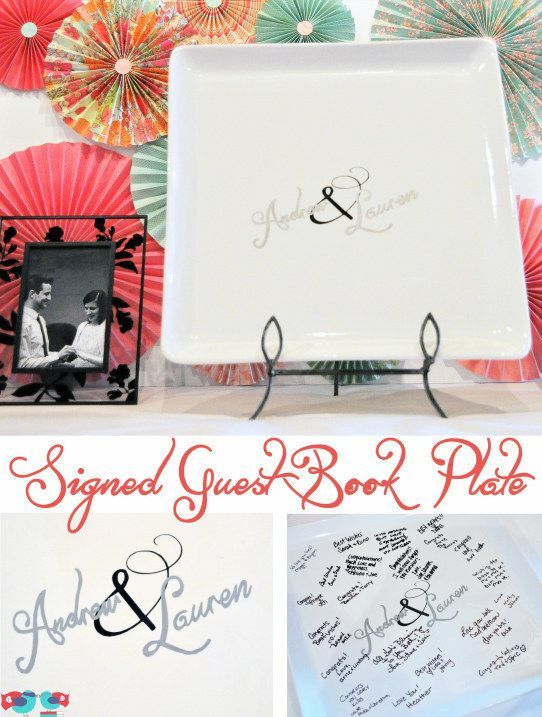 How wonderful to have a guest book that you can actually see and use every day! 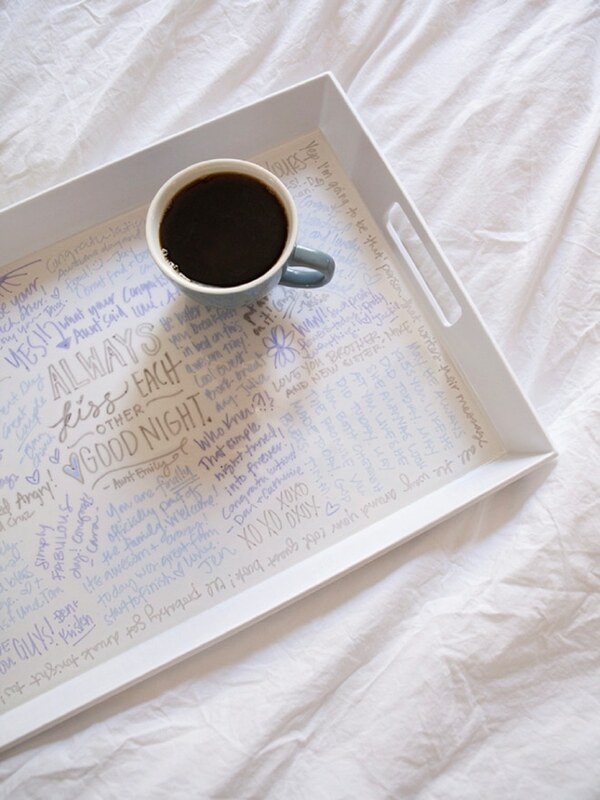 Using a plate as a guest book is actually easy to make. Here are the instructions. 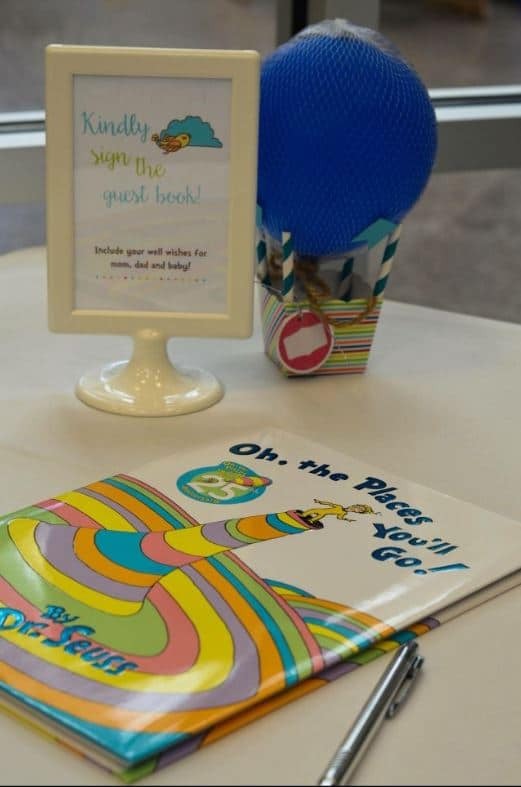 A message in a bottle is a sweet baby shower guest book idea because it’s unique and actually very cheap to do. 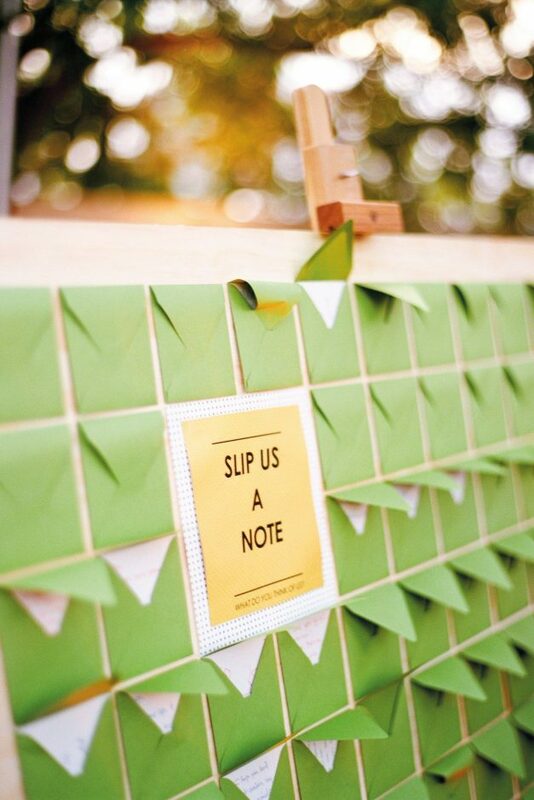 This guest book alternative idea is common for weddings but you can absolutely do it for a baby shower too. 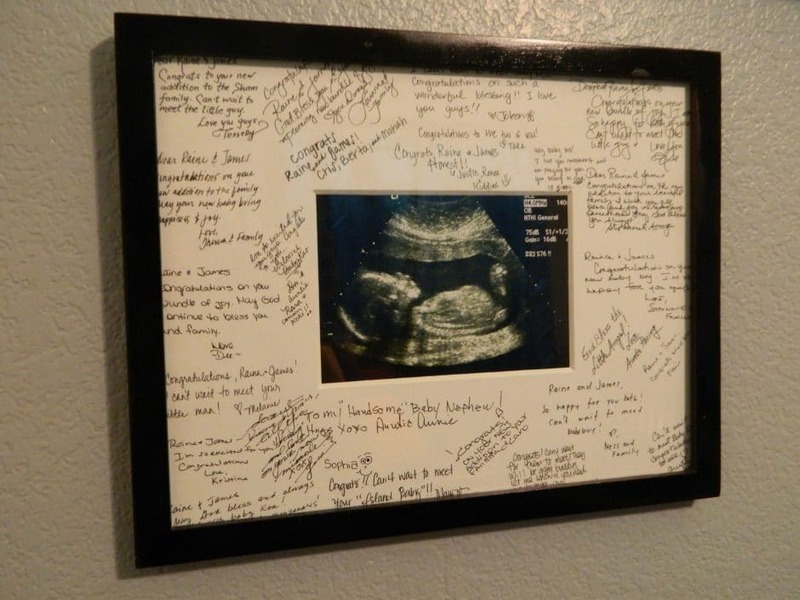 Guests could write wishes for the new baby, or they could write predictions. Or how about sleeping under the well wishes of friends and loved ones? 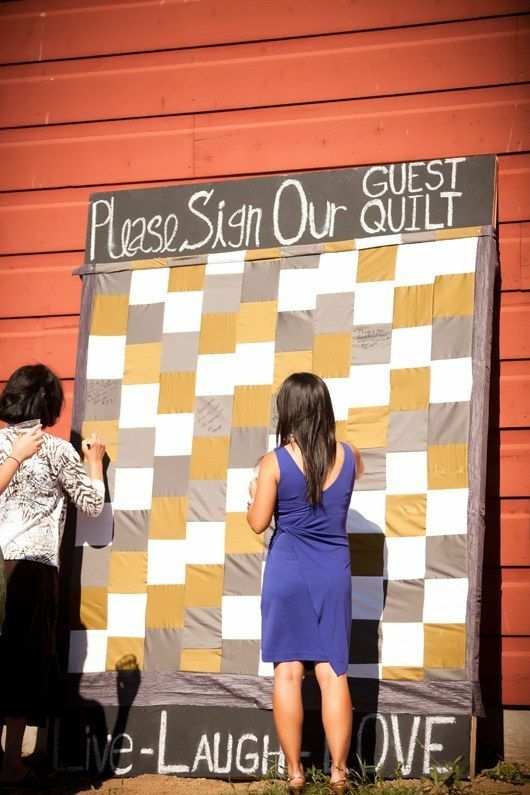 If you are so inclined, you could make your own quilt or buy a quilt that guests can write on. All you will need are a few sharpies to ensure that the messages don’t get washed out. What a unique idea! All you will need is a blank jigsaw puzzle. These are not hard to find! You could buy one or print one for free from Google. 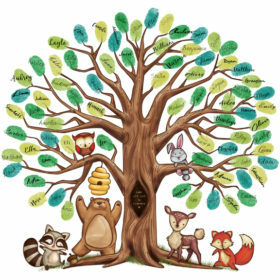 Your guests can write their messages, and this can be framed to hang in baby’s room. 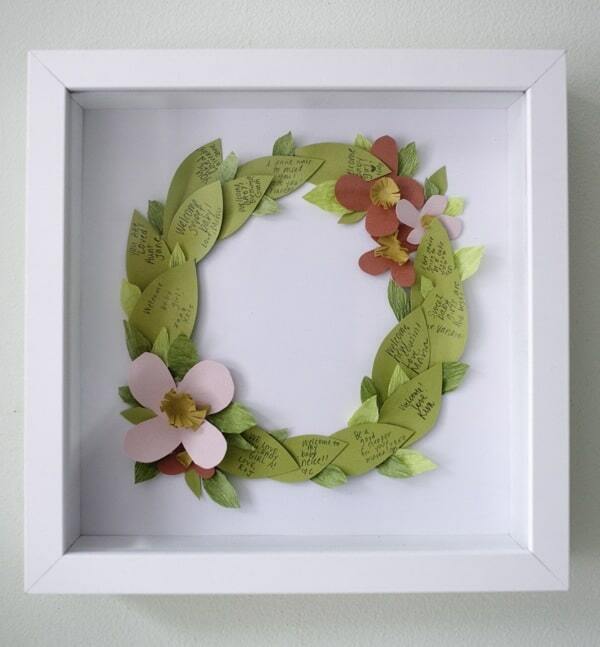 The well wishes from your guests can also become a framed artwork, like the leaves on this wreath. If the new parents are into games, consider getting them Jenga. It’s fun and a great way to unwind. 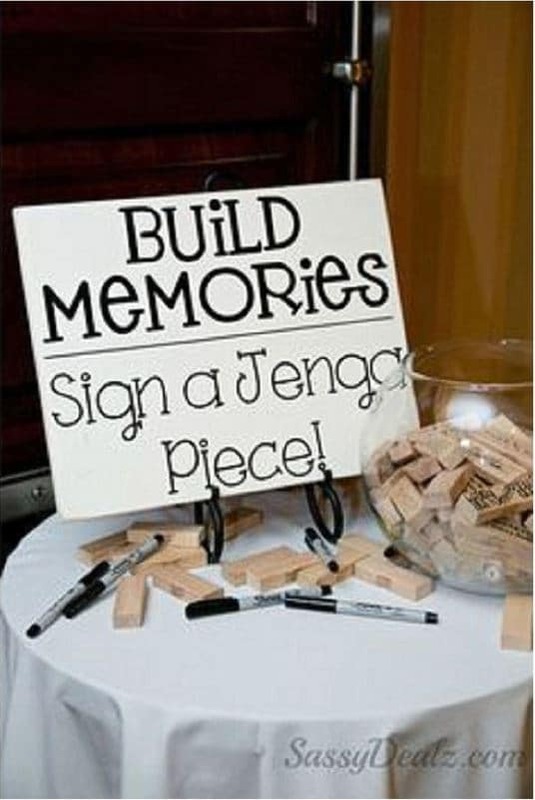 All you need are sharpies, and Jenga. Washi tape (to stick the polaroids to the paper); Markers. You know how players get the game ball after a big game? 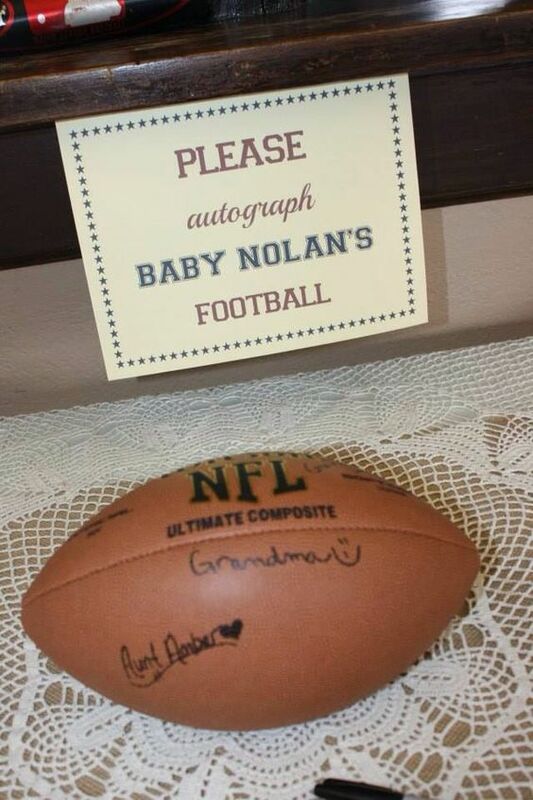 Now you can create a game ball for the new baby to cherish. 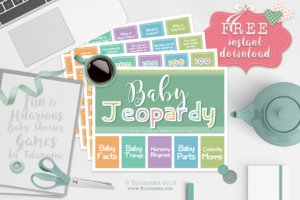 If lots of people are invited to the baby shower, ask guests to write their names only. If few people are invited, there may be room for a name and a short message. How cute! You could set this up as your baby shower decor too! You can find outlines just about anywhere online. The challenge would be cutting out each individual outline. You could also do different kinds of outlines. 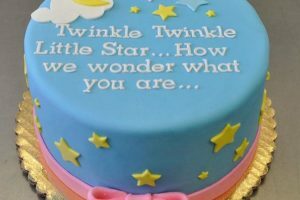 If you are having a Twinkle Twinkle Little Star baby shower, you could use stars. If you’re having an elephant baby shower, use only elephants, etc. 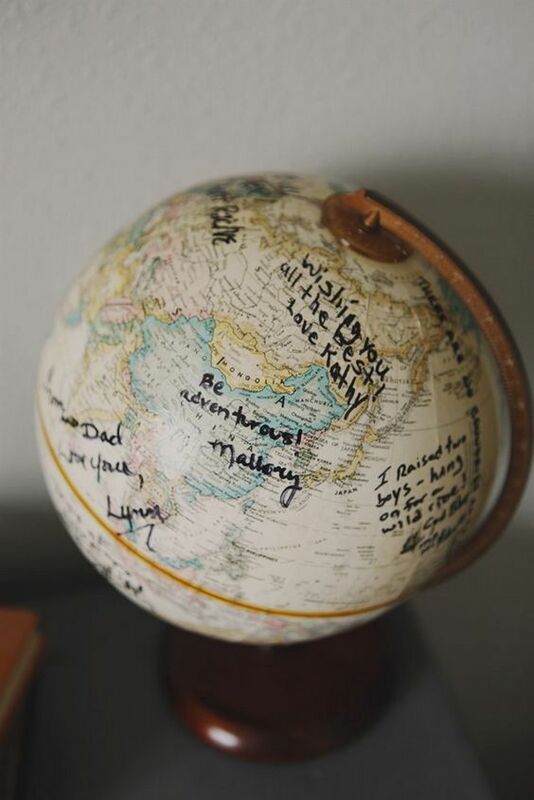 If mom and dad are avid travelers, this is a great idea for a guest book alternative. 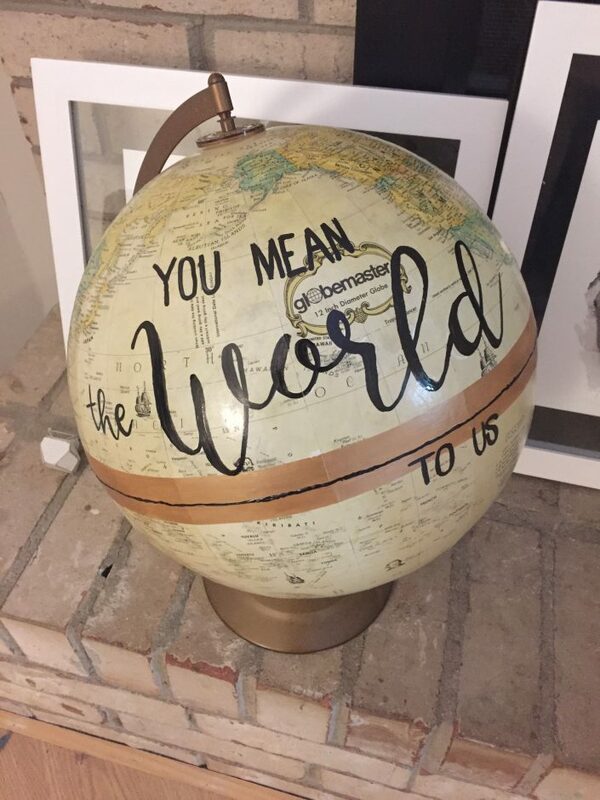 Simply ask guests to sign their name on the globe. This also makes a great decoration for any room. This will be quite appropriate if you are having a jungle themed baby shower. You could also do this with a leopard or other animals that have spots. The spots are made with guests’ fingerprints. 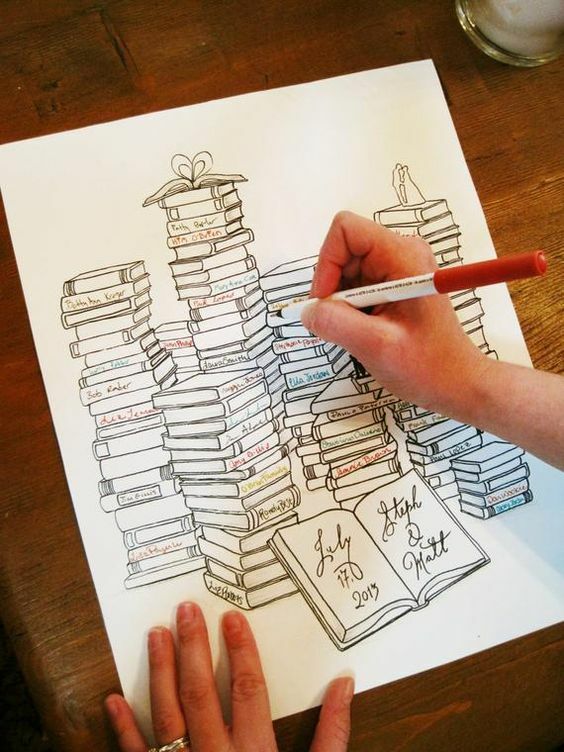 If you are having a library or book-themed baby shower, this is a perfect guest book alternative. There is no room for messages but guests can write their names as the titles of the books. It can then be framed for baby’s nursery. These are custom made, and available from Etsy. If the parents are sports enthusiasts, consider using their equipment. 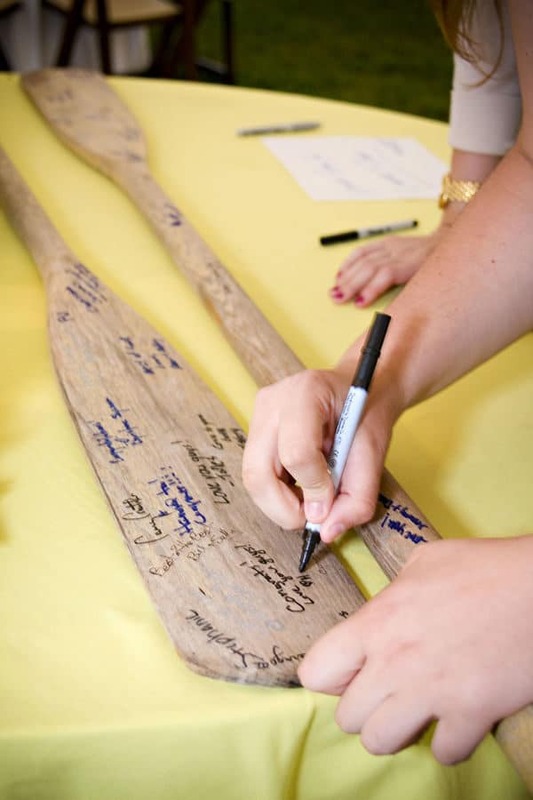 For example, guests could sign a paddle, a bat (for baseball or cricket,) perhaps a team jersey. 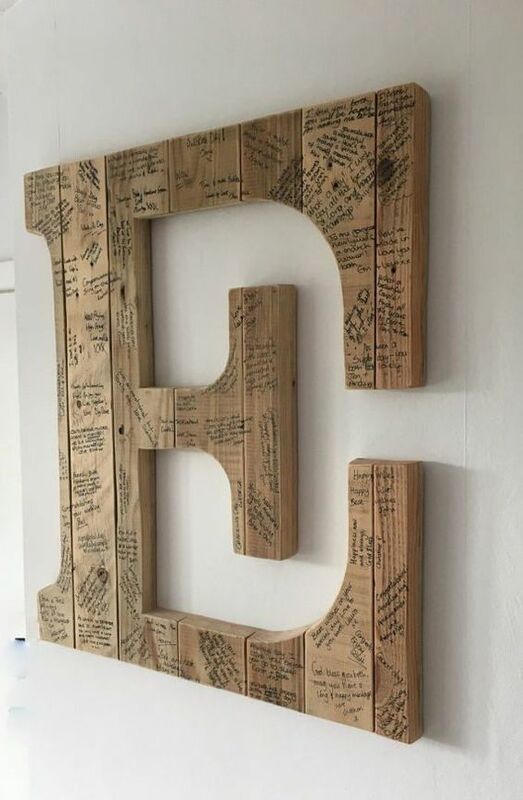 Creating a guest book out of things you use often, is a great idea because then you get to see your “guest book” all the time. Using a serving tray is another great one. Click here for full instructions. 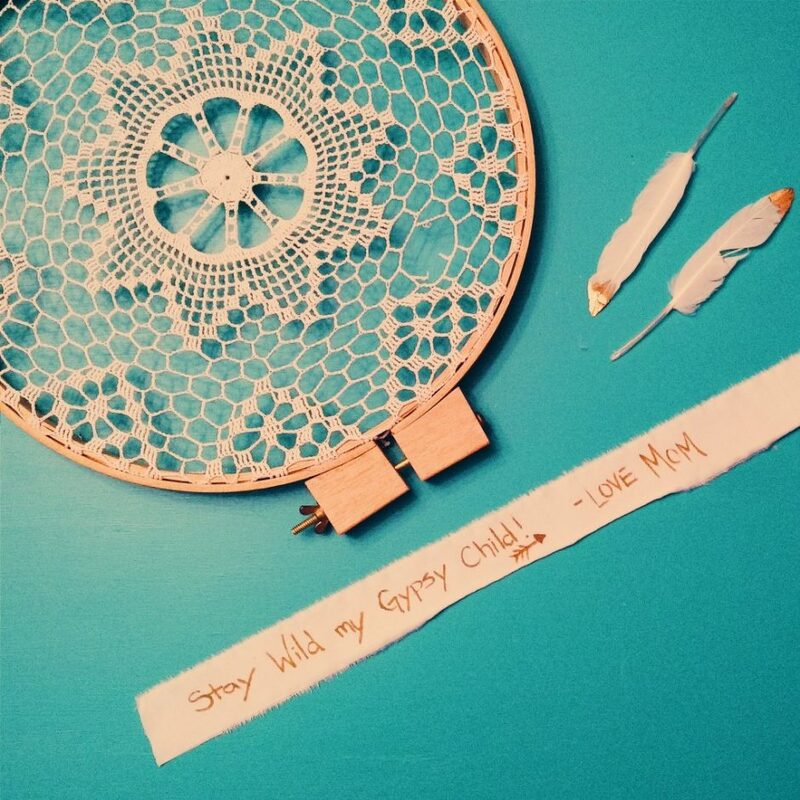 Having a boho themed baby shower? This dreamcather would work perfectly. Click here for how-to instructions. 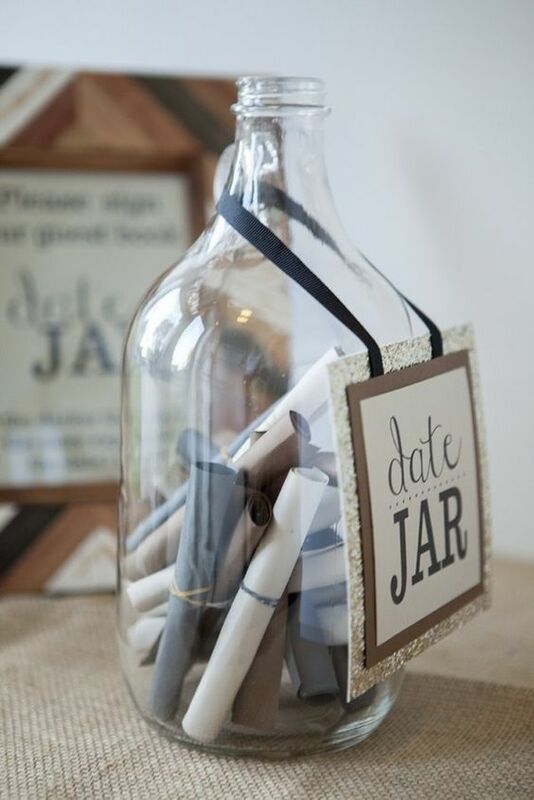 and markers for your guests to write their names and messages. 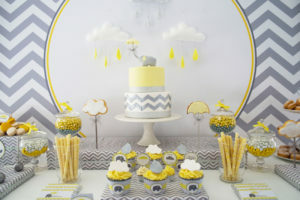 The woodland theme is another popular one for baby showers. 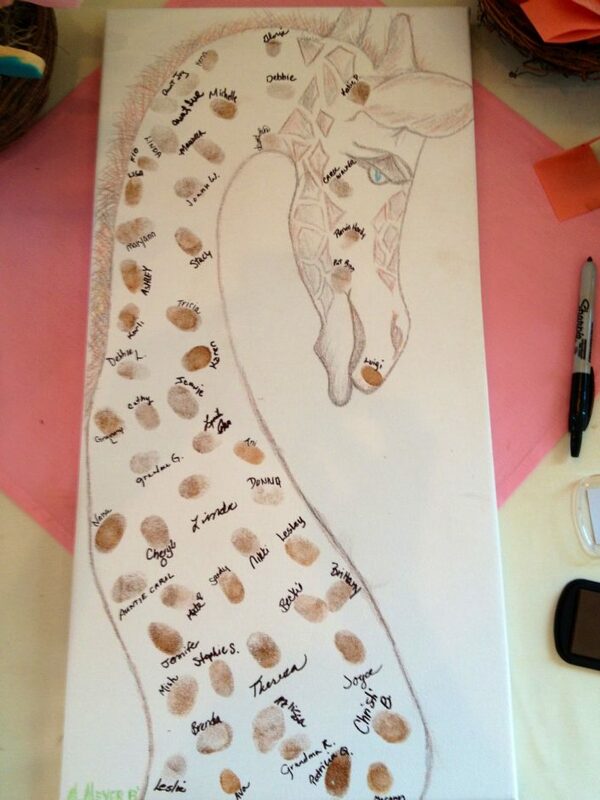 If this is your theme, this particular fingerprint canvas will be great for your shower. The setup is easy. The canvas and the ink come in a gift-ready package, so all you do is display it. 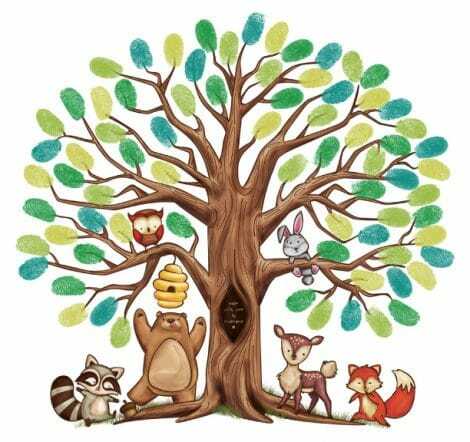 Guests leave their fingerprints and when the shower is over, the canvas can be hung in the baby’s nursery. So it’s a guest book and nursery decor! 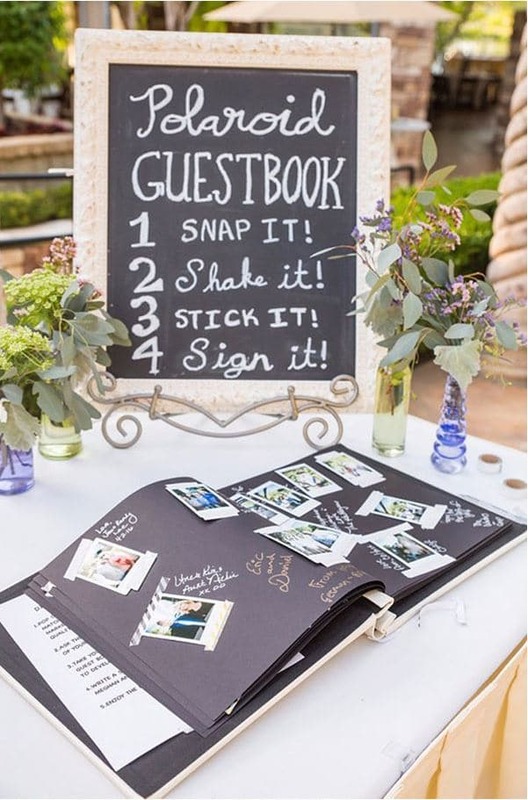 Another one of many unique guest book alternatives. This one will take a bit of time to set up but absolutely doable. This can also be framed to hang in your home. 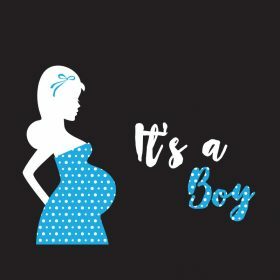 This is somewhat similar to the ultrasound framed image above but a little different in that you can use any frame you like and you can put any picture you want inside the frame. 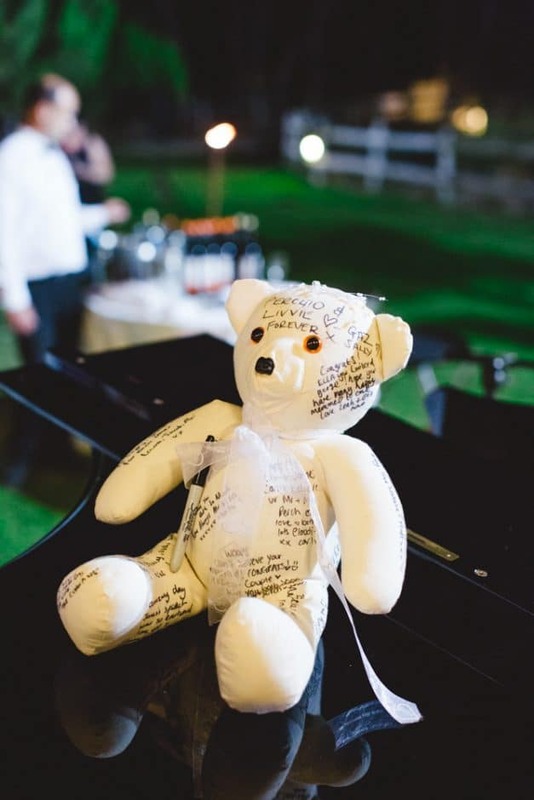 Memory bears are usually made out of baby clothes for your child to keep but you can start with a memory bear as your guest book. If you can sew, you can make your very own memory bear. 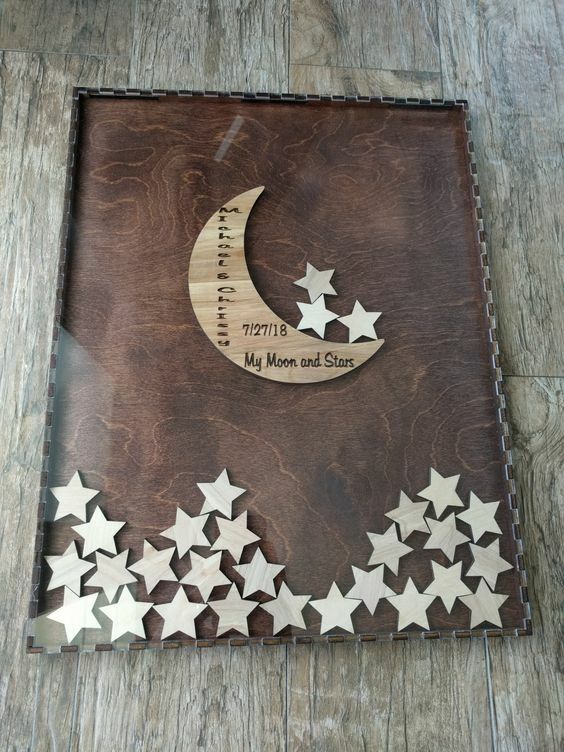 This frame can be custom made to have your baby’s name in the moon. Guests would then write their names on the little stars, and drop them into the frame. This is another great alternative that you can hang on your wall and see every day. 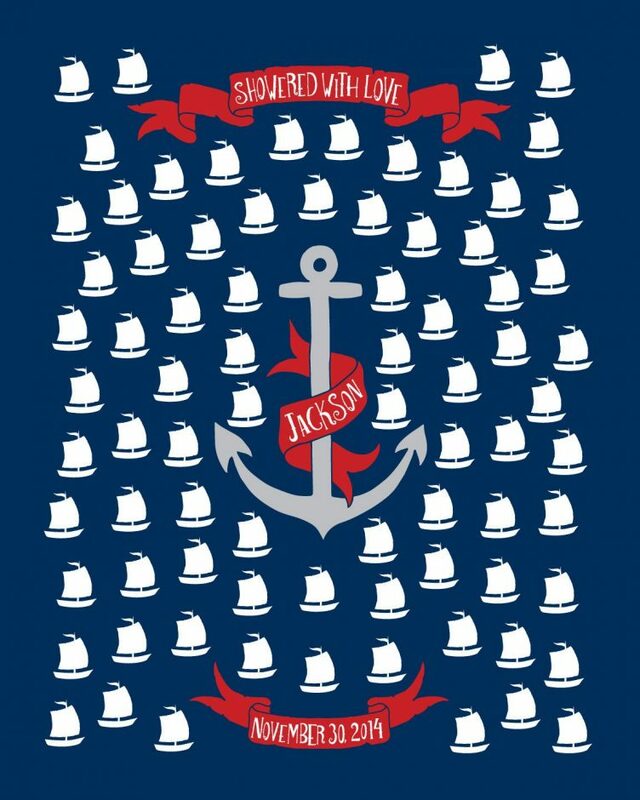 This poster is for a Nautical baby shower theme but you can have different themes. Guests write their names in the little boats, and you can frame the poster afterwards. If you prefer a little more room for messages too, you may choose a bit more space, like in the poster below. 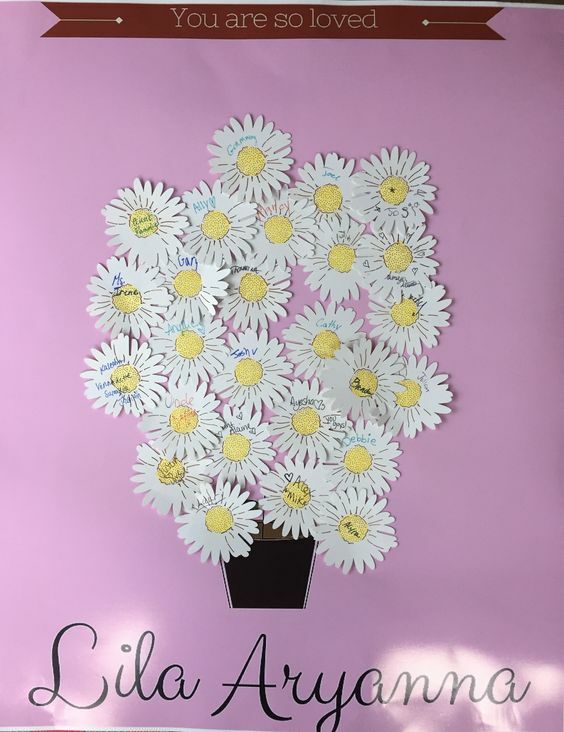 to create your little flowers. 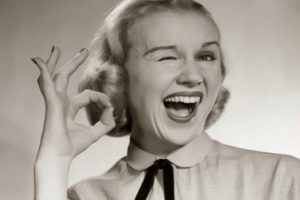 , markers, and you’re done!